What Is WP Memory Limit? Why Do I Need To Increase My WP Memory Limit? How To Increase The WP Memory Limit? Why Do I Need To Increase My Maximum File Upload Size? How To Increase The Maximum File Upload Size? What Is The Maximum Post Size? Why Do I Need To Increase My Maximum Post Size? How To Increase The Maximum Post Size? What Is The Maximum Execution Time? Why Do I Need To Increase My Maximum Execution Time? How To Increase The Maximum Execution Time? What Is The PHP Max Input Vars? Why Do I Need To Increase My PHP Max Input Vars? How To Increase The PHP Max Input Vars? What Is The PHP Max Input Time? 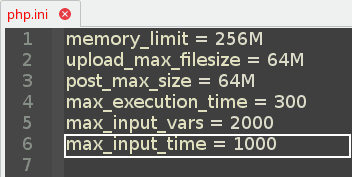 Why Do I Need To Increase My PHP Max Input Time? How To Increase The PHP Max Input Time? Please, arrange a full backup of your website before you follow or apply any section from this guide. Make sure to contact your hosting provider if you are not sure about a certain option or feature. If you are not exactly sure what you are doing, please seek an expert technical assistant to help you with your query. This guide is only provided for reference purposes. The sections written below may or may not work on your server depending on your configurations, hosting provider limitations, and settings. The WP Memory Limit is the maximum amount of memory (RAM) that your website can use at one time. When your site reaches the allocated memory limit, you will encounter a fatal error. There are several factors that contribute to the consumption of your memory. The notable ones are your WordPress itself, the theme that you are using, and the list of active plugins. Generally speaking, the bigger and more complex your website is, the more memory it needs. 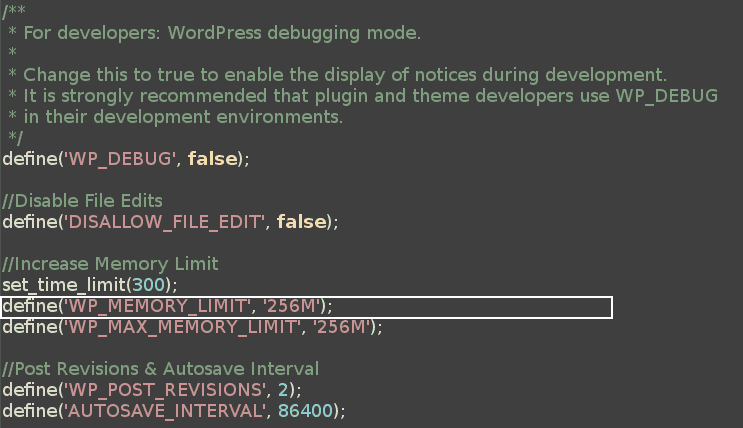 The default memory limit for WordPress is 32MB. This limit might be enough for small websites with limited number of plugins and visitors. However, if you need to install a fully functional demo of a premium theme or you have a large list of custom plugins that require installation, then increasing your memory limit would be a wise action to take. Basically, when you start encountering the "Fatal Error: Memory Size Exhausted", it would be the right time for you to make such changes. Please check the notes section before applying any step from this tutorial. 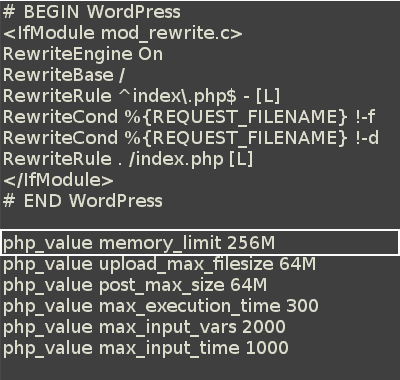 Our recommended value for the WordPress Memory Limit is: 256MB. Step 1 – Find or locate your php.ini file. If you can not find it, then simply create your own php.ini file and place it in the root directory of your WordPress installation. - Change the 32M or any number you find there to your desired limit (e.g. 256M). Step 3 – Save your changes and reboot your local host or server. Important Note: Many shared hosting providers restrict you from accessing the php.ini file. This method is only applicable in case you have direct access to your php.ini file or if you are running your WordPress on a local host. 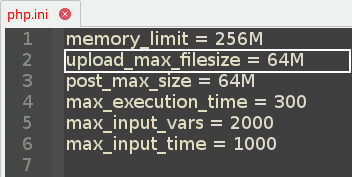 It is good to note as well that this method only affects your PHP memory limit. 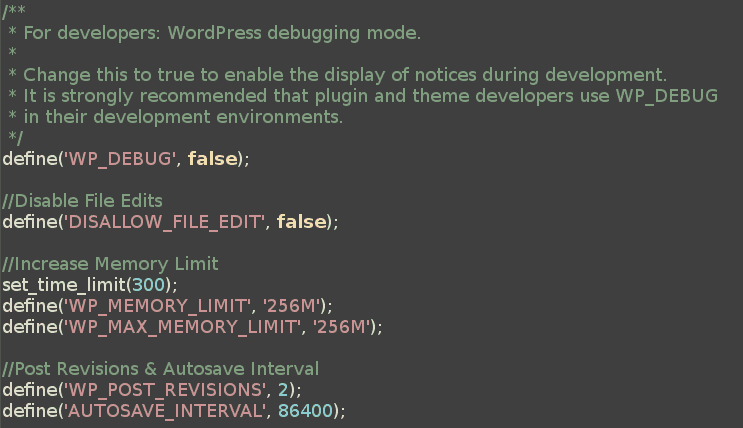 Step 1 – Find your wp-config.php file in the root directory of your WordPress installation. Step 3 – Save the wp-config.php file then refresh your website. Step 1 – Search for your .htaccess file which should be located in the root directory of your WordPress installation. If you can't find it then it might be hidden. Thus, make sure to check your hidden files when locating it. Step 3 – Save the .htaccess file then refresh your website. It is the maximum allowed size for a file to upload to your WordPress website. A file can be a plugin, theme, image, audio, video, or any other kind of file. The default size is 2MB which is considered by many webmasters a very low upper limit for the allowed upload file size. If you upload big images, audio/video, or plugin files that surpasses the default limit, then it might be easier for you to increase your maximum file upload size along with your maximum post size instead of constantly using the FTP manager. Our recommended value for the Maximum File Upload Size is: 64MB. Step 1 – Open your theme files and locate the functions.php file. You can also contact your theme developer for assistance if required. Step 3 – Save the functions.php file then refresh your website. - Change the 2M or any number you find there to your desired limit (e.g. 64M). Important Note: Many shared hosting providers restrict you from accessing the php.ini file. This method is only applicable in case you have direct access to your php.ini file or if you are running your WordPress on a local host. It is the maximum size of allowed post data. This setting also affects file upload. 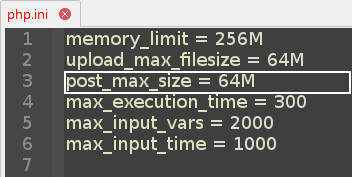 To upload large files, this value must be larger than upload_max_filesize. Generally speaking, memory_limit should be larger than post_max_size. If you upload big images, audio/video, or plugin files that surpasses the default limit, then it might be easier for you to increase your maximum post size along with your maximum file upload size instead of constantly using the FTP manager. Our recommended value for the Maximum Post Size is: 64MB. - Change the 32M or any number you find there to your desired limit (e.g. 64M). Maximum execution time of X seconds exceeded. ( Where "X" is the value ). 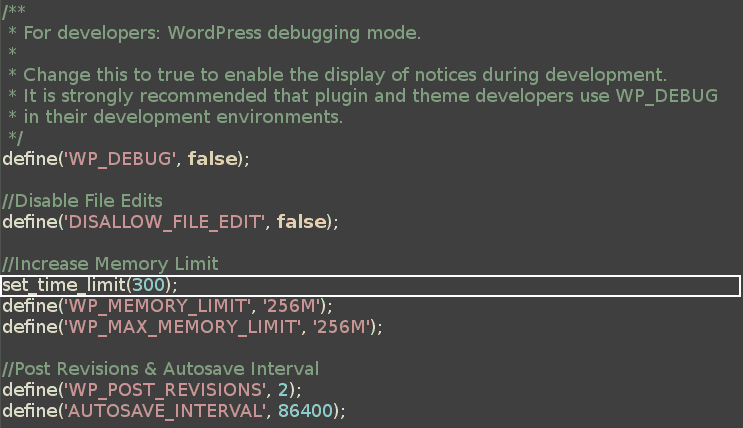 If you installing a big plugin or a complete demo for a theme, then the default value of 40 seconds might not be enough to complete the operation. You can also increase your PHP time limit temporary then decrease it back after the completion of your long operations. Our recommended value for the Maximum Execution Time is: 300. - Change the 40 or any number you find there to your desired limit (e.g. 300). The PHP Max Input Vars is the maximum number of variables your server can use for a single function to avoid overloads. 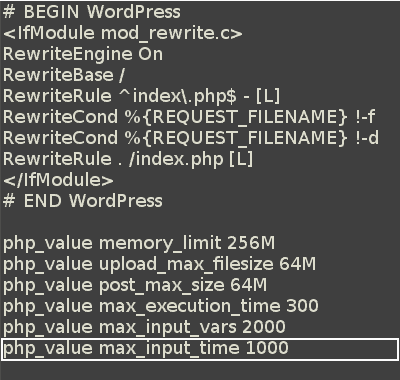 The default value of the PHP Max Input Vars is 1000. Increasing the PHP Max Input Vars helps in solving some issues related to your menus. If your menu items are not saving successfully or the last entries are being truncated or left off, then increasing this value will be a recommended action. This is especially useful when you are installing a big demo for a theme with lots of menu entries. Our recommended value for the PHP Max Input Vars is: 2000. - Change the 40 or any number you find there to your desired limit (e.g. 2000). The PHP Max Input Time sets the maximum time in seconds a script is allowed to parse input data, like POST and GET. Timing begins at the moment PHP is invoked at the server and ends when execution begins. 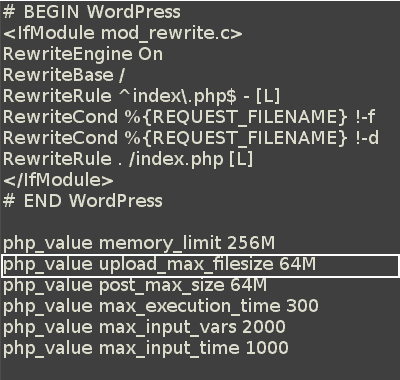 Increasing the PHP Max Input Time helps in solving issues when uploading large files or installing a big demo of a premium theme. 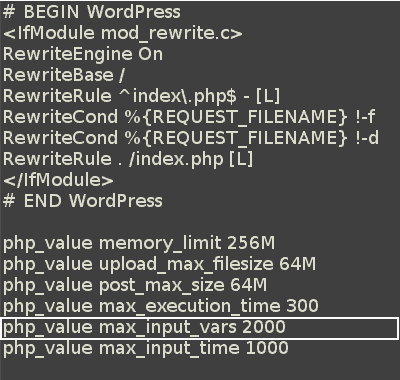 Our recommended value for the PHP Max Input Time is: 1000. - Change the 120 or any number you find there to your desired limit (e.g. 1000).